Dave is a long term member of the American Wine Society (AWS) and is a graduate and Certified Wine Judge from the AWS Wine Judge Training Program, within which he also instructs, mentors students, and administers the final examination. The AWS has also recognized Dave as its Outstanding Member in 2011. Dave is on the Board of the Atlantic Seaboard Wine Association where he has co-chaired their annual Wine Competition for over ten years. 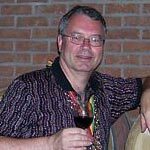 Dave has presented innumerable wine seminars or various topics and has judged in many wine competitions, as well as having written many articles that have been published in various wine magazines. He currently works with various Virginia wineries in their tasting rooms and also at various festivals. Dave also enjoys travelling and has visited numerous wine areas on three continents and has been inducted into several wine brotherhoods in the United Kingdom, France, Spain, Serbia, Switzerland, and Hungary as well as being a Master Knight within the Brotherhood of the Knights of the Vine of America where he also serves as the Provost General of the Northeastern United States.